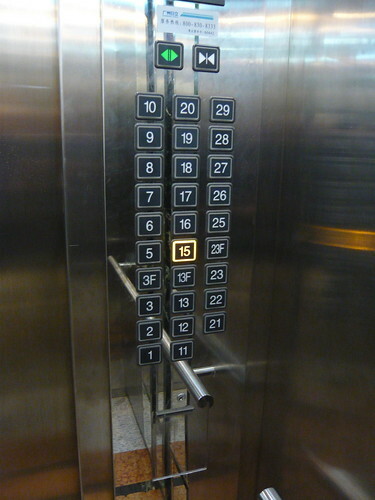 As we all know that in Western cultures, the number 13 is considered unlucky and as such it is not uncommon to find the 13th storey missing in the older colonial buildings in Singapore. So the usual practice would be to skip the number 13 entirely or to add an extra level on 12 i.e. Level 12 then Level 12A before going up to Level 14. Well, it seems that this building that my friend is currently staying in Spitland has more of less the same idea, except that in Ch1nese culture, the number 4 (which symbolises death) is the unlucky number instead. But wait, it doesn't just stop at the number 4 but all numbers with the number 4 in it. Hence as you can see in the picture on the left, we have Floors 3F, 13F and 23F to which the ang moh would say is lagi suay since now got not 1 but 2 x Level 13s. So anyway, my part of Spitland is relatively ulu compared to the big cities like Shanghai, ShenZhen and Beijing i.e. skyscrapers. I can imagine what they would do to Level 40 to 49 of a 50-storey-or-higher building? They stop at 39 lor..